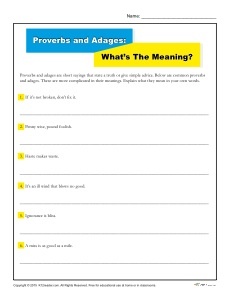 Proverbs and Adages Worksheet | What's the Meaning? Proverbs and Adages: What’s the Meaning? Proverbs and adages are short sayings that state a truth or give simple advice. This activity includes several common proverbs and adages that are more complicated in their meanings. Students use their own words to explain what each proverb or adage means.